Juvenile hormone (JH), produced by the corpora allata, regulates two important processes in insects. The first is development; as an insect develops, the degree juvenility of the next stage is determined by the amount of JH in the blood; the lower the JH, the more adult the next stage. Experimental removal of the corpora allata results in premature development of adult characteristics. JH occurs in several forms, the most common is JHIII, which is shown here. The other function of JH is, in many insects, to regulate the production of eggs in the female's ovaries. Because mating behavior is often synchronized with the ovarian cycle, it makes sense for mating behavior and pheromone production to be linked with JH. In some insects, including species of cockroach this is exactly the case. In other species the role of JH has evolved one step further, so that the linkage with ovarian activity is lost. In the most intensively studied species, the honey bee, many scientists think JH regulates the behavioral activities of workers through their life. In burying beetles JH has also apparently lost its role in controlling reproduction, instead regulating social behavior. Aggressiveness of guard bees is correlated with their blood JH levels, for example. Even though guards have high JH levels, their ovaries are relatively undeveloped. 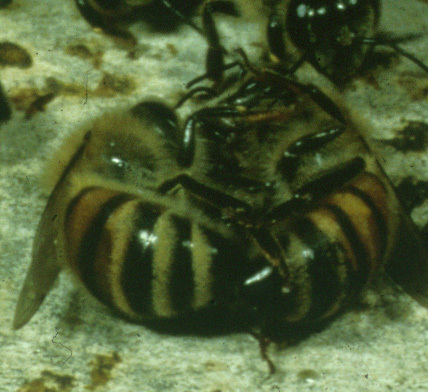 In this picture a guard bee has attacked a bee from another colony, preventing her from entering the guard's nest. This behavior prevents robbing of honey from the nest by bees from other colonies. It is not an easy trick for the guards to tell which incoming bees to attack and which to not. They do this by smelling odors on the surface of the incoming bees; the bees that do not smell like nestmates are attacked. Nestmate recognition is similar to kin recognition, and is expressed by most eusocial insects--termites, ants, bees and wasps.